Beaded jewellery is a fantastic form of jewellery making. There are countless beautiful design possibilities and it is a technique that is available to all levels. However, as with all handmade items there are areas that can sometimes be a little confusing or hard to overcome. For example, we often come across questions such as; What tools are available for beading? What is the best way to finish my design? How can I stop my thread wearing against the clasp? What thread is suitable for heavy beads etc. At Kernowcraft we have a huge variety of beautiful gemstone beads as well as a great selection of beading tools, accessories, findings and threads. In this page we answer as many questions as we can to help you when choosing your beading equipment. WHAT IS THE DIFFERENCE BETWEEN TOP DRILLED AND HEAD DRILLED BEAD? Top drilled beads have a small hole drilled down the top of the bead so that you can glue in a peg to hang as a pendant or earring drop. Head drilled beads are drilled horizontally all the way through nearer to the top of the bead. This is so they hang below the thread, rather than the bead sitting centrally on the thread. For an explanation of all the different bead holes click here to read our bead hole information page. WHY WILL BEADS THREADED ON SILK NEED RESTRINGING? Pearls or beads threaded on silk thread will need restringing periodically as the silk will deteriorate with time. Restringing silk strung items is recommended every year or two, depending on the frequency of wear and how you care for them. As a guideline, if the silk between the beads is still bright white and clean they will not need restringing yet, if however it is discoloured or you can see dirt accumulation it is probably time to restring them. HOW CAN I STOP THE BEADS WEARING AGAINST THE THREAD? If any of your beads have slightly rough edges around the holes, you can use a bead reamer with the 45 degree diamond tip to smooth and neaten the holes, if you don't already have a bead reamer, you will find it a very useful addition to your kit, as it can also be used to slightly enlarge the holes in beads, if you find they are too small for you wire or thread. HOW CAN I STOP THE THREAD WEARING AGAINST THE CLASP? Using gimp wire (also called french wire) to cover the thread as it goes through the clasp will prevent it wearing and give your necklace or bracelet a tidy finish. We also stock thread protectors which are a finding that does the same thing as gimp wire but give a slightly different look. These are available in sterling silver and gold filled. They give a very neat finish. WHAT THREAD IS SUITABLE FOR HEAVY BEADS? For large, heavy beads you will want a thread that will not stretch or break - one of the most popular threads we stock is the flex-rite wire. This is very strong (made from 49 strands of stainless steel coated in nylon) yet still flexible and can be knotted and crimped. Alternatively, if the holes in the beads are big enough, you could use leather thong or cotton cord. WHAT IS GIMP WIRE AND HOW DO I USE IT? Plated gimp wire also known as `french wire` is a very fine coiled wire used to cover exposed thread to protect it from wearing against fastenings as well as give a neat tidy finish. It will take thread up to 0.7mm in diameter and is is Nickel Safe and complies with EC Nickel regulations. When you have finished threading your beads, add a crimp, then slip a short length of gimp wire onto the thread. Thread through the loop on the clasp, then back through the crimp and then squeeze firmly with pliers. WHAT THREAD SHOULD I USE FOR THREADING PEARLS? 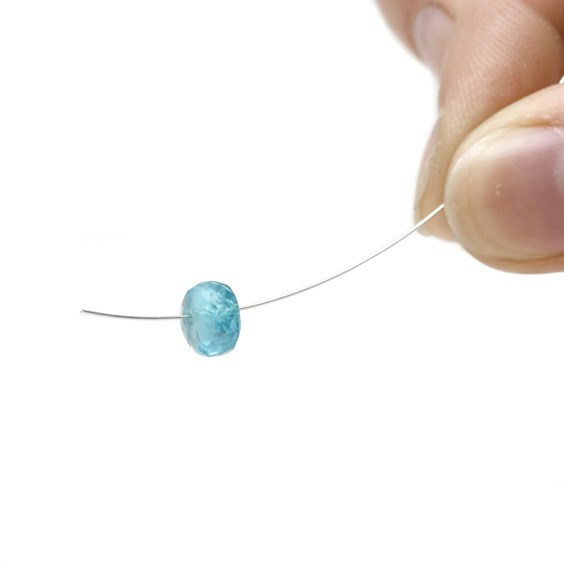 Pearls are often drilled with very small holes, so you will need a very fine thread, such as natural silk thread or for extra strength the extra fine flex-rite wire, which is strong, flexible and unlike silk will not need restringing with time. If you are planning on knotting between each bead however, flex-rite wire will not be suitable as the strand would not lie flat.